I’ve read several nonscientific studies that concluded students type equally well whether they use iPads or traditional keyboards (click here; scroll to ‘Keyboarding: iPad vs. Traditional’). These results are counter-intuitive to what common sense says is true: that the flat, non-tactile nature of the iPad onscreen keyboards make them less accurate and slower than standard keyboards. Until there is sufficient evidence to contradict this perception, schools continue to kit their iPads out with detachable keyboards. This they believe–and is probably true–makes them more versatile and responsive to student and teacher educational needs. 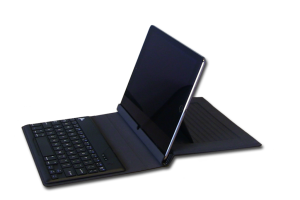 I’ve spent a lot of time reviewing these add-on keyboards and was thrilled when Felix offered me one of their versatile Bluetooth-enabled FlipWrite keyboards to test out for my classes. Right up front, I liked what I received. It’s light weight and includes an iPad stand that enables me to place my iPad horizontally or vertically at a variety of adjustable angles, responsive to either viewing or typing. If I’m not using the keyboard, it can fold under the iPad out of the way, allowing me to use the iPad as a tablet. When I’m not using the iPad, I can store it in the Flipwrite folio case, which is barely larger than the device itself and only about twice as thick (less than an inch). The charge is supposed to last two+ months, a claim I haven’t yet tested, longer by far than any of my other digital devices. Set-up was quick and intuitive. After charging the keyboard, I slipped the iPad into the Flipwrite’s slot, paired the Bluetooth, and it was ready to go. The keyboard itself is a truncated version of what you get with a desktop–64 keys with no number pad or F-row. It’s more utilitarian than all-encompassing, but it has every key you’d require for word processing. Overall, this is a solid solution to classroom iPad typing needs at a very reasonable price. Especially during end-of-year testing, this could be exactly the solution you need.